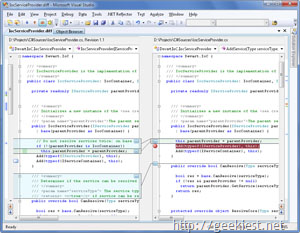 Here are some Free Add-ons am using with the Visual Studio 2010. When a new tab is inserted and existing tabs don't fit in the document well, instead of removing the tab at the end of the well it will remove the least recently used tab. This ensures that frequently used tabs are readily available. This sample was built to ease your pain when working with regular expressions. 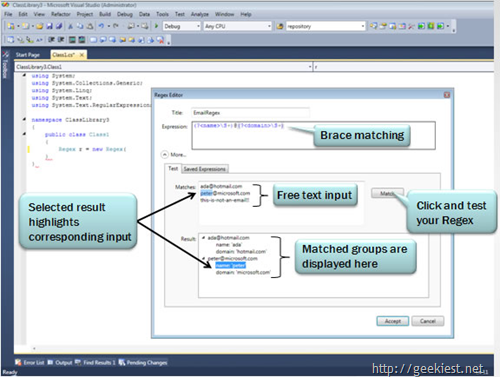 It rehosts the editor in a dialog box and provides a basic language service to provide colorization, brace matching, sample testing grouping and selection tracking. It shows re-hosting of the editor in a tool window, and provides a nice starting point for similar projects. CodeCompare is a totally free tool and an absolutely new way of source code comparison. It offers enhanced Visual Studio Editor, IntelliSense and syntax highlighting, code folding, advanced code comparing and merging functionality, and simple source control system integration - these are the features you were looking for all the time and finally they are at your fingertips! You can get more tools for your Visual studio from the Visual Studio gallery. The Visual Studio Gallery provides quick access to tools, controls, and templates to help you get the most out of Visual Studio. 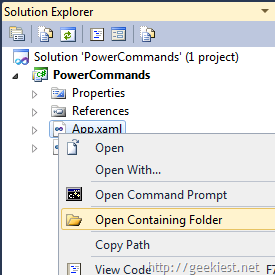 You can browse, subscribe to RSS feeds and share your extensions with the Visual Studio development community.